When you work with National Merchants Capital you're receiving an advance, on future receivables. A merchant cash advance is NOT A LOAN. There is No Personal Guarantee and No Collateral needed to receive the money you need quickly with No Hassle. The money can be in your account in as little as 3-5 business days. Applying is Easy. Approval is Fast. Get the small business funding you need when you need it – Hassle-Free! 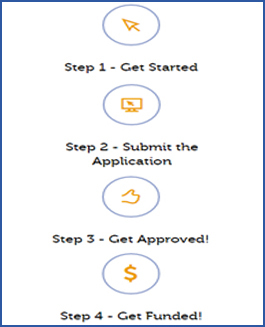 Your application is our way of determining how much capital funding you are eligible to receive. It is based on how much you process in credit card sales per month, not on your credit score. The application process is easy, and there are no fees. With an easy approval rate, you really have nothing to lose! Get Funded - Qualifying merchants can receive as much as $250,000. This is based on your credit card sales and/or bank deposits for each month. Using your statements to determine anticipated sales, we can offer you a set amount quickly and painlessly, and can get it to you more rapidly than traditional lending methods. Your cash advance could appear directly in your account in as little as 3 days. Auto Deductions - You will NEVER have to write a check. With two options for payment, you decide how you want it to work. There are no actual payments or late fees, so there is nothing to worry about. 1. Credit Card Sale Auto Deductions - A percentage of your future Visa/MasterCard sales each day is automatically forwarded back to MCS through one of our processing partners until our agreement is fulfilled. The percentage remains the same, so the actual monetary amount transferred fluctuates based on your profits. 2. Automated Clearing House - Electronic transfers are made directly from your account to ours. A fixed, predictable, monetary amount, as opposed to a percentage, is determined upon approval, and funds are transferred seamlessly on a daily basis.